Before François Thibaut founded his world-famous Language Workshop for Children® centers in 1973, American educators had waited until high school before offering formalized language instruction. But Thibaut had a better method. Thibaut recognizes that children make the best language students. Play. Children remember the words that make them happy. 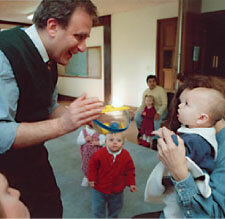 Over the years his renowned Thibaut Technique successfully taught tens of thousands of children to learn new languages. Now Professor Toto brings the LWFC into homes and classrooms everywhere. Thibaut's method combines carefully structured curriculum with a child's innate love of play, capturing the window of opportunity years when children possess their greatest capacity to absorb and retain language and acquire flawless pronunciation. Professor Toto systematically engages a child's mind with original LWFC songs, stimulating humor, interaction, prompts, time-tested visual aids, and more. Happy LWFC songs teach a language's distinct sounds, unique grammar, and every-day vocabulary, motivating kids to practice their new language. That is why Professor Toto won six major children's media awards. Bring Francois Thibaut's unique magic to your child with the Professor Toto Language Education Kit. Mr. Thibaut is a member of the National Association for Education of Young Children (NAEYC), the National Network for Early Language Learning (NELL), American Association of Teachers of French (ATTF), American Association of Teachers of Spanish and Portugese (AATSP), American Association of Teachers of Italian (AATI), the Foreign Language Educators of New Jersey (FLENJ), and the National Afterschool Association.